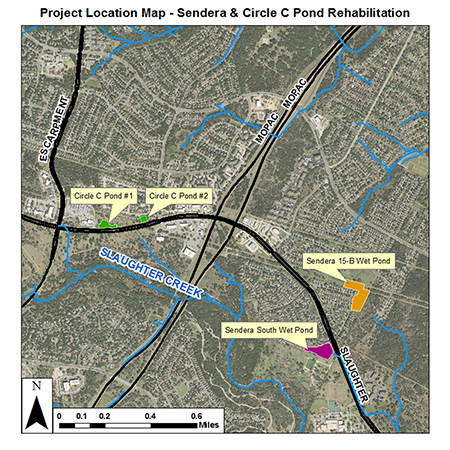 Four ponds maintained by the City of Austin in the Sendera and Circle C neighborhoods are in need of repair. These ponds were designed with clay liners that have proved inadequate. Their deterioration could lead to polluted stormwater entering the aquifer that feeds Barton Springs. This project will replace the clay liners with modern geomembrane liners. It will also improve berms and irrigation systems around the ponds. When construction is complete, the pond edges will be revegetated with native wetland plants. The ponds were designed as stormwater detention basins for flood control and water quality treatment. Over time, the pond liners have been impacted due to drought conditions and erosion. The clay liners of the ponds have degraded and limestone has been exposed, leading to leaking. 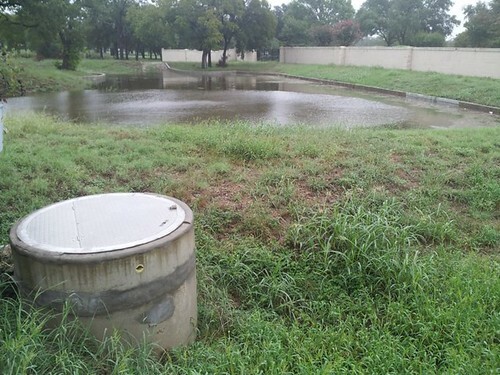 As a result, the ponds do not hold the volume of water they were designed to retain after runoff-producing rain events, nor do they hold the water for as long as current City standards require. Two retention/irrigation ponds serve the Circle C Ranch Phase C, Section 9 neighborhood near the intersection of Escarpment Boulevard and Slaughter Lane. The other two serve the Sendera 15B and Sendera South neighborhoods. They are located near the intersections of Slaughter Lane and Bremner Drive and Slaughter Lane and Norman Trail. Wet weather can be disruptive to the construction schedule due to the nature of the work. Construction began in April 2018. Major construction of all four ponds is complete, and revegetation is underway at the two wet ponds. The two ponds at Circle C require additional repair work that is projected to be completed by summer 2019.